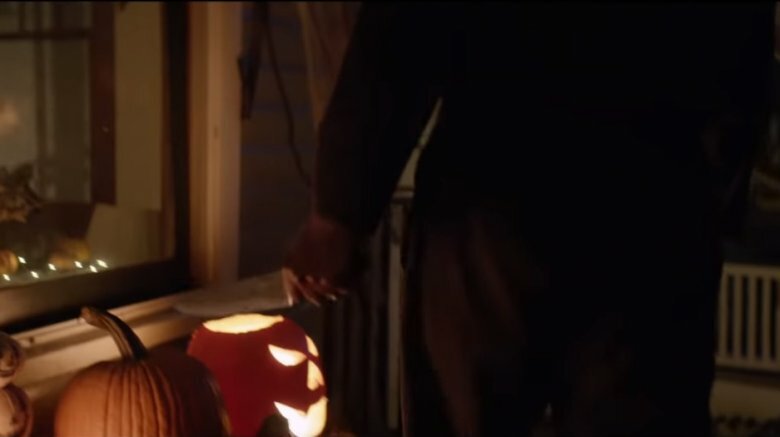 With just weeks to go before it's finally released on October 19, 2018, a second trailer for the upcoming Halloween has arrived to terrify us all, and just like the last one, it's packed with interesting details that you might not have seen at first glance. The new film from writers Danny McBride and David Gordon Green (who also directed) was made in cooperation with Halloween co-creator John Carpenter, and it's taking the franchise to places the previous films never tried to go. This film, set 40 years after the fateful night when Michael Myers returned home to Haddonfield, Illinois, will ignore all previous (and increasingly convoluted) sequels. Instead, the new story will show us a version of Laurie Strode (Jamie Lee Curtis) who's been waiting, even "praying," for the day Michael would finally be on the loose again — so she can end him and his murderous evil once and for all. 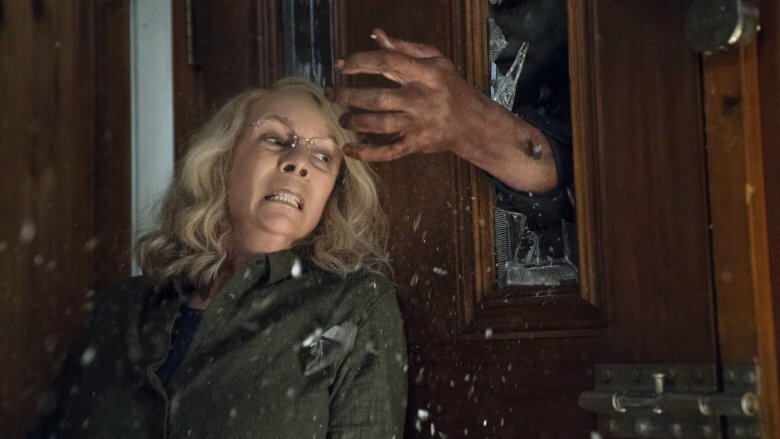 The depiction of Laurie as a woman with a decades-long history of trauma and vengeance on her mind, plus a version of Michael Myers that's less like the supernatural machine he became and more like the murderous Shape we saw in the original film, has fans eager to see where this story goes, and the new trailer only adds fuel to that fire. Without further ado, let's take a look at what the new trailer revealed to us — and all the small details you may have missed. 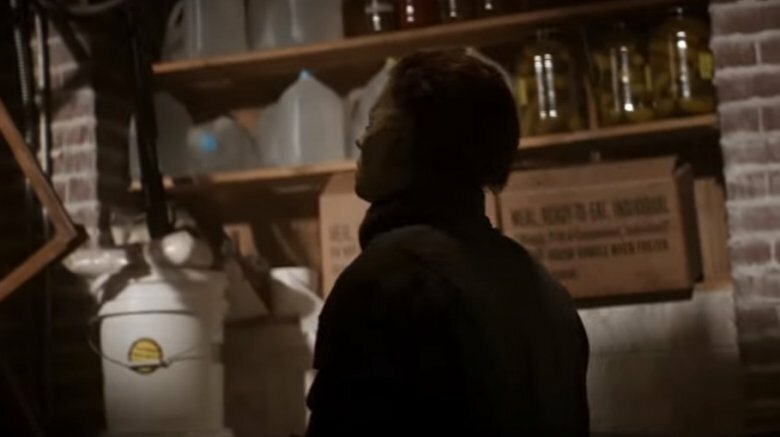 As expected, all the footage we've seen from Halloween so far is packed with echoes and homages to the original film and even some of its sequels, and the new trailer shows us more of that from the very beginning. The first words we hear this time around are "trick or treat," which echoes the sing-songy voices of children that rang out as the 1978 film's opening tracking shot began. After that, we follow two boys as they go about their Halloween night, trying to decide which house to plunder for candy next — when they run into a tall, rigid figure in a black jumpsuit who not only terrifies them but barely seems to react to them at all. 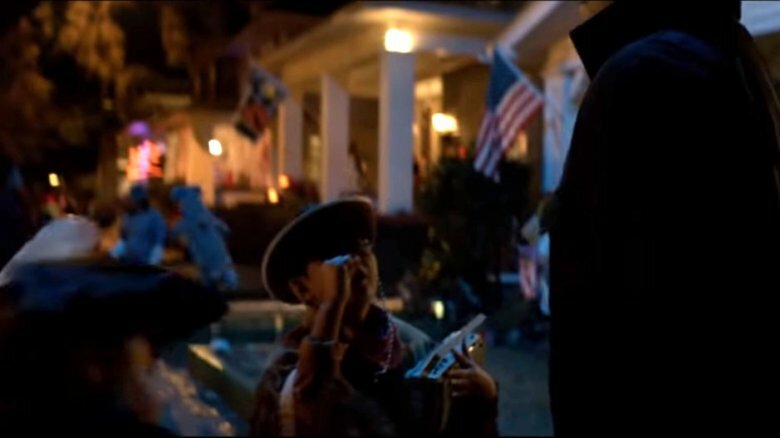 The kids scurry away, and Michael (played by both James Jude Courtney and original Michael Nick Castle in the new film) goes on about his murderous business. The shot mirrors a daylight scene in the 1978 film, when one of the boys bullying Tommy Doyle runs away from school only to smack into Michael's torso, look up briefly at his masked face, and then run away in horror. In the original film, the adult version of Michael Myers is listed in the credits as "The Shape," in part to lend a spooky aura to the character but also to describe him as a faceless, emotionless embodiment of evil that moves less like a human and more like an entity, walking slowly and deliberately around Haddonfield with the simple purpose of killing and frightening as many people as possible. 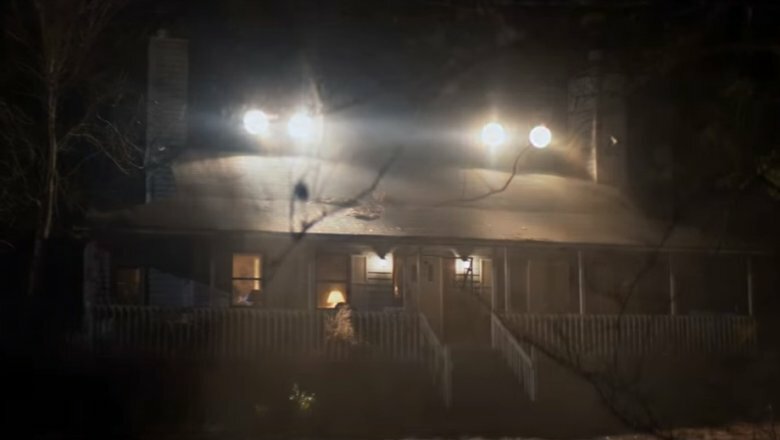 After Michael's run-in with the kids in this trailer, he turns and walks up a woman's driveway while the camera follows him in a classic John Carpenter-esque tracking shot. When he reaches her back shed, he picks up a hammer, then walks into her house, kills her with it, and procures his weapon of choice: a long butcher knife. From there he moves on to another house, and another victim, never hesitating or expressing any real emotion. This shot shows us not only how Michael gets his knife back (which the trailer reveals again and again in future scenes), but also how The Shape is reborn in this film as a silent, stalking killing machine. The jack o'lantern is synonymous with both Halloween the holiday and Halloween the film, particularly the grinning orange pumpkin that lights up throughout the original's opening credits sequence, creeping ever closer to the camera as Carpenter's legendary theme music plays. As Michael stalks the streets of Haddonfield, we see them over and over again, and a simple symbol of a fun season of spookiness becomes imbued with horror as the film goes on. Jack o'lanterns are, of course, present in the new film as well, but in an exaggerated form. One of Michael's first victims in the trailer is a woman whose porch is lined with countless variations on the classic decoration, and he seems to be inspired by her enthusiasm. Later in the film, a character opens a car door to reveal a jack o'lantern made, presumably by Michael, out of human skin. It's not clear whose face it is or how much we'll see of this particular creation, but it's an amazing gore moment, and a frightening twist on a classic. 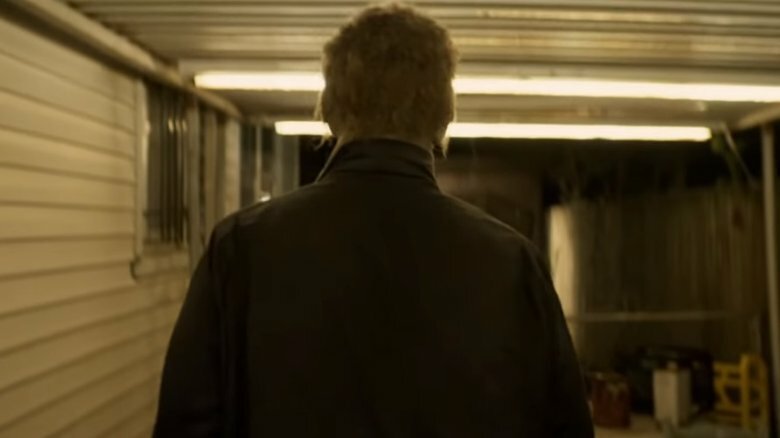 Early in the trailer, as Michael walks toward his first victim in the footage, we hear Laurie's voice declaring "Forty years ago, on Halloween night, Michael Myers murdered three people." It's an eerie and very effective voiceover, and it's the first piece in a series of things throughout the trailer that help to re-establish the legend of Michael Myers. 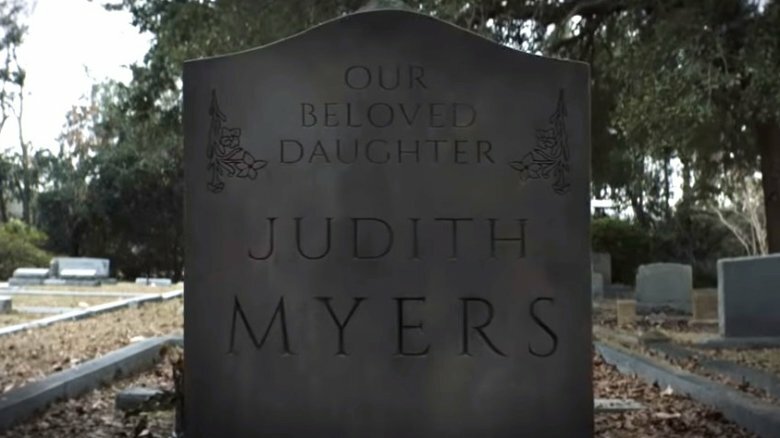 The original film opens with a point-of-view shot as a young Michael wanders through his childhood home and eventually murders his sister Judith, and in this trailer we see a pair of documentarians (who also appeared in the previous trailer) stopping by Judith's tombstone, and noticing that a figure in white seems to be watching them from afar. These are brief glimpses, but they help to string together a pattern of destruction in Michael's life. He murdered his sister, was institutionalized, broke out, murdered three more people in 1978, and then was locked up again. Ever since then, Laurie's been waiting for the moment, which always seemed inevitable, when he would break out again so she could kill him. These three events, including the bus crash that leads to Michael's latest escape, are strung together to great effect in the trailer, reminding us that this is a confrontation decades in the making. Laurie Strode has spent the last four decades preparing for the return of Michael Myers, but along the way she also managed to have a family, even if that family seems to think she's a little nuts. In the new trailer, she chastises her daughter Karen (Judy Greer) for her lack of a security system, and while Karen simply insists that her mom "need(s) help," we can see quite clearly that Laurie needs no help in the security department. We've already seen in her past footage practicing her target shooting and revealing her underground bunker and supply of canned food, and we now we get to see more of her In-Case-of-Michael setup, including a hidden gun cabinet, spotlights on her roof, and a panic room door that slams down as she prepares for a confrontation. It will be really interesting to see how all of these little preparations play out in the film, particularly when you consider that Laurie is less concerned with being protected from Michael and much more concerned with killing him. That begs the question: Is that door meant to keep him out, or to keep them both in? The original Halloween film created an intense atmosphere of dread by contrasting the comforting, harmless surroundings of suburbia with the terror of a masked figure stalking people in the night, and it was so good at it that by the end of that movie even the most mundane things became almost enchanted with fear. This was particularly true of bed sheets, which appeared on a clothesline in a scene in which Laurie thinks she sees Michael outside her window and — most famously — in the scene in which Michael hides himself under a sheet before murdering Lynda (P.J. Soles), who thinks he's just her boyfriend messing with her. 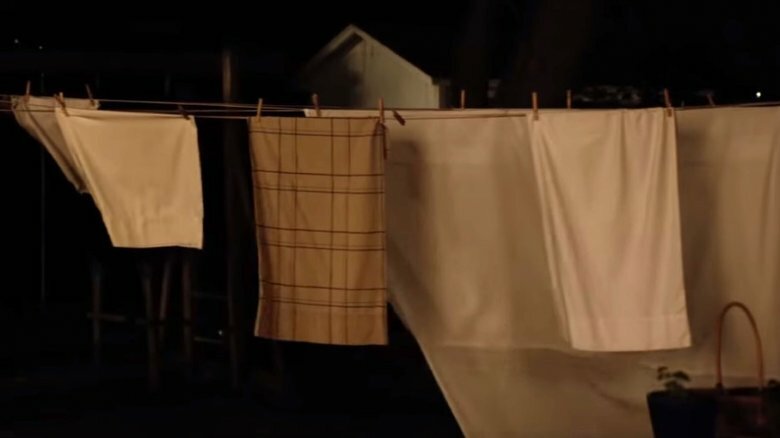 The first trailer showed us the new film's homage to that scene, and now the new trailer shows us an homage to the clothesline scene, with a simple shot of linens hanging out on a line in the suburban darkness. On any other night that would be a harmless sight. On this night, something terrifying could be lurking behind every piece of cloth. The new Halloween film is, as previously mentioned, disregarding all sequels, but even the other films in the franchise usually disregarded one sequel: The 1982 installment Halloween III: Season of the Witch. That film, the only one in the franchise not to feature Michael Myers, was intended to set up a kind of anthology future for the franchise in which various horror stories connected to Halloween night could be told, but it proved unsuccessful and, while some fans have reappraised it, it's been maligned by Michael Myers devotees for years. It's not without its own very prominent defenders, though, and it turns out Green and McBride may be among them, because Season of the Witch gets a very clear shout-out in this trailer. 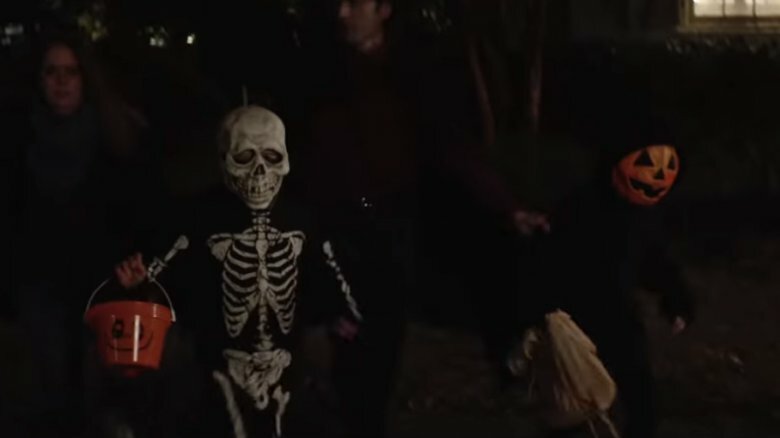 In the scene in which Laurie screams for kids and their parents to get off the streets, we see three children run by wearing three different masks: A witch, a skeleton, and a jack o'lantern. These three masks were made by the Silver Shamrock Novelties company in Halloween III, and were part of an evil plot to kill anyone wearing them when they watched the Silver Shamrock commercial on Halloween night as part of a ritual to resurrect the old pagan festival of Samhain. The plot failed and the franchise returned to Michael Myers, but in this shot at least, Silver Shamrock lives on. Ask anyone who's seen the original 1978 Halloween — whether they've just watched it for the first time or they've been a fan for years — to name the most memorable moments in the film and you'll almost always hear about one in particular: Laurie Strode, sitting exhausted in the foreground after seemingly finally killing Michael, and Michael suddenly sitting up. It's a jumpy enough moment to generate a scare with its mere existence, but it's made all the more terrifying by the silence surrounding the scene and, most importantly, the stiff way in which Michael sits up. He doesn't move his arms, doesn't flail, doesn't prop up on his elbows. He just bends and the waist and there's that horrifying white mask looking at you again. It's a key piece of the physicality of The Shape, and since Castle is one of the actors playing him this time around, it makes sense that it would have a triumphant return. In the trailer, after Laurie knocks him down the stairs and into the cellar, Michael does the iconic sit-up once again, to the horror of Laurie and every fan watching.